Metallica has been in the press a lot lately. They were inducted into the Rock and Roll Hall of Fame on April 4th. Also, this Spring, Guitar Hero Metallica was released. We tend to post more on the music genres we are familiar with, but with all this attention, I'm going to delve into the world of thrash metal. Really, I just wanted to add "Metal" to our label cloud. So what does a thrash metal ("an extreme subgenre of heavy metal that is characterized by its fast tempo and aggression") band have to do with palliative care? It was recently pointed out to me (by my husband) that Metallica's lyrics are often based on their life experiences. In fact, Metallica vocalist James Hetfield once said "All our songs deal with my youth in various ways." "Until it Sleeps" was written by Hetfield and Metallica drummer, Lars Ulrich based on Hetfield's experiences and losses. Hetfield was raised as a Christian Scientist. When he was 16, his mother (a devout Christian Scientist who is said to not have believed in or sought traditional medical treatments) died from cancer. Her death is also said to have been the inspiration behind the songs "The God That Failed" and "Leper Messiah" (obviously a recurring theme!). Many years later, his father also died from cancer. Per music lore, Until It Sleeps was written about cancer. The song starts " Where do I take this pain of mine, I run but it stays right by my side". He goes on to describe something inside that "grips", "stains", "hates". Something that needs to be torn out and washed away. At first, I interpreted this as being the cancer. But could it be the pain and loss caused by the cancer? Sort of a way of showing the similarities between the two (the physical form of the cancer eating away at the body and the emotional pain eating away at soul). Why does he say "And the hate still shames me"? 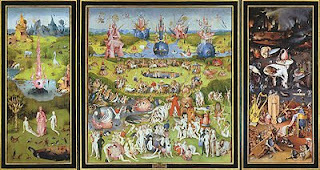 The video is inspired by the Renaissance painting, The Garden of Earthly Delights, (particularly the third panel of the painting representing hell) by Hieronymus Bosch (Wikipedia link has a great close up of the painting when you click on it) and other works of art that depict the fall of man. There is a lot of religious imagery which could represent some of Hetfield's own struggles with religion. A word of warning: This is a heavy metal video and some of the imagery is disturbing. These images do not represent the views or opinions of Pallimed or any of it's writers. Note prominent the fall-of-man themes throughout. Well, Amber, I've never followed heavy metal or Metallica. If I've been around anyone who has I've been unaware of their interest. Nonetheless, I found the video entrancing and the song seductive. I agree that the element, inside and out, that the lyrics indicate needs to be "torn out and washed away" is Pain. Before I listened to the song and watched the video (but had read the lyrics), I, too, was mystified about the phrase, "And the hate still shames me." As I watched the video, though, I noticed the appearance of Jesus leading up to, during and after the crucifixion and realized that maybe the lyricist is referring to hating the pain that shames him. According to Christian mythology, Jesus took on the pain, gladly, without hating it, not only to accomplish what he did while alive but to accomplish the purpose of his death. I was fascinated, too, by the appearance of the baby (innocence, I suppose) in the midst of the intricate pain scenario. Maybe the message of the song is that the lyricist believes that to conquer pain one must embrace it, "love" it, I guess, rather than hate it. The song and your comment made me think about the whole person kind of pain we see. Physical (cancer), psychological (hate, shame), and spiritual (maybe represented by the religious images?). I'm not sure about the baby held by the tree. Could be innocence but how does that fit in with the overall message of the song? And what about the tree? Anyone know of any art or mythology that this might reference?